The 2018-19 school year is off to a great start throughout the Little Chute Area School District. We are excited to be in our new spaces at the Intermediate/Middle/High School complex, while also seeing our staff and students continue to utilize technology to enhance student learning. As a learning community, we are continually looking to improve Little Chute Area School District. One source we use to reflect on our strengths and areas for improvement is the State School Report Card. The Department of Public Instruction (DPI) generates a School Report Card and District Report Card for every publicly funded school and district in the state. These public report cards can be found online at: http://dpi.wi.gov/accountability/report-cards . The Report Cards are intended to help schools and districts use performance data to target improvement efforts that ensure students are ready for their next educational step – whether it be the next grade level, graduation, college, and/or career. 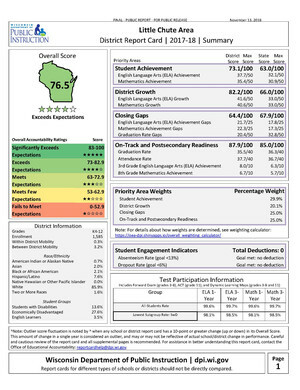 State report cards can be accessed online at https://apps2.dpi.wi.gov/reportcards/ along with resources that explain the report cards. Again, as DPI stresses, these report cards are just one source of information about our schools. The Educators and Administration of the Little Chute Area School District looks forward to working with you to make 2018-19 a successful school year for your child! If there are any questions or comments, please do not hesitate to contact me.